If you have ever found yourself in an unwanted circular never ending discussion with someone on the left chances are you have found yourself as frustrated as John Cleese in this infamous skit from Monty Python's Flying Circus from the 1970s. Liberals never change their tactics. Since the election of Obama, this nation has been subjected to one after another distortion, mis-statement, speeches filled with half-truth's based on straw man arguments, misdirection, tall tales, double speak, and a blurring of real facts that are breathtaking in both their scope. Obama certainly employs all of these tactics, as well as his administration. Every interview, speech, or appearance by by Obama, or his Cabinet. If you watch FOX news, and the pundits on any of the various shows, you will see this Cognitive Dissonance in nearly every segment when there is a discussion of any political topic with a Republican and a Democrat on the left. The Democrat immediately heads to an altruistic "feelings are fact argument." "1. Red Herrings: Premises or ideas that are irrelevant to a particular conclusion, but which are offered as evidence of the conclusion. 2. Straw Man: Deliberately setting up a false target that is easier to defeat in an argument. 3. Begging the question: The situation where the truth of a conclusion is assumed by its premises. 4. Selective use of evidence: In any analysis there is usually a large amount of evidence to consider, particularly when there is sufficient complexity involved. Sometimes it is easier to pay attention only to evidence that supports the desired conclusion and not to evidence which contradicts it. 5. Moving the goal posts: Is a common practice in denial and occurs when someone always demands more evidence than can currently be provided. If that evidence becomes available at a later date, the demand is made for even more evidence, ad infinitum. 6. Argument by definition: Is changing the meaning of words or concepts so that they support your argument (e.g. "it depends on what the meaning of 'is is"; and other distortions of language like using the opposite meaning of a word as in George Orwell's Newspeak). 7. Liar Paradox: Is the use of paradoxical statements (e.g., "This statement is false" or "There is no objective truth") that are linguistically correct but internally inconsistent and cannot be demonstrated to be either true or false." Chances are after your first encounter with a 'libidiot', you may, like me, be inclined to wear a helmet, and some chest high waders, have a paddle and a nitwit net for your next exchange of facts and the obfuscation you will encounter with a 'true believer agenda driven leftist reality distorter. Is it even possible for the left to ever give up their denial of the failure of the Obama Administration? Or have Democrats become so jaded and intent on forcing the agenda of the Obama Administration down our collective throats they will resort to any means to win not just a discussion between voters, but debates and an election. 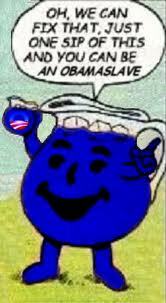 Has the left been completely poisoned by the blue Koolaid they are drinking? Clearly the Mainstream Media is involved in enabling the Obama Administration, along with commentators, all are obscuring what anyone paying attention to real everyday facts. The latest social theater of the absurd can be seen in the Occupy Wall Street protests all over America manufactured by the left and enjoined by public and private sector unions. These ginned up protest are an effort to fire up the now very depressed far left base of the Democrat Party as Americans and Independent voters are now holding the Obama Administration accountable for their failed policies. In this article from the Weekly Standard, Matt Labash says, ..."When I arrive at Occupy Wall Street (OWS) ground zero at Zuccotti Park, only a few blocks over from the World Trade Center ground zero, the first revolutionaries I encounter are two masked-up anarchists named Spooky and Newport. They wear studded leather jackets which bear hand-painted inscriptions like “Fight War, Not Wars” and are clad in black from head to toe. Except Newport additionally sports a chartreuse fright wig and sunglasses with reflecting marijuana leaves on the lenses. They seem to know they’re a spectacle, since they stand in front of a cardboard sign that reads “Pictures for change or a dollar.” Meaning the passing fanny-packing tourist hordes or smirking financial sector barbarians can get their snaps taken with Spooky and Newport as if they were mascots at Disney’s new Protester World Experience..."
Lenin was certainly right. There is no subtler, no surer means of overturning the existing basis of society than to debauch the currency. The process engages all the hidden forces of economic law on the side of destruction, and does it in a manner which not one man in a million is able to diagnose..."
Is it even possible for a Democrat to be honest in addressing any of the dire issues this nation faces? Can Democrats be straight talkers about the economic difficulties, high unemployment this nation faces without a true astroturfed organized event to ramp up the emotions and class warfare of America's Left? It sure does not appear the left is capable of embracing the limited government Free Market model found in the Constitution from my perspective. ..."As long as the left continues to live in the world of denial and play their rhetorical games and use their non-logic to justify the unjustifiable, to tolerate the intolerable; and support the unsupportable; then I will continue to blog and expose their motives and hidden agendas; and do everything I can to prevent them from regaining political power."